We’d love your help. 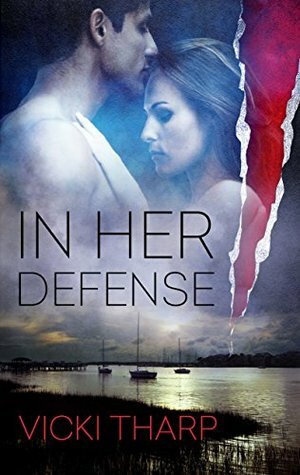 Let us know what’s wrong with this preview of In Her Defense by Vicki Tharp. When her new client is murdered after handing her new evidence that could acquit him, lawyer Danielle Mckeen is determined to find out why. A miscarriage and the collapse of his marriage to Danielle years before has left Jack Walsh reeling and slow to trust. But with a protective streak tattooed on his soul, he can’t refuse Danielle’s cry for help. While in possession of t When her new client is murdered after handing her new evidence that could acquit him, lawyer Danielle Mckeen is determined to find out why. While in possession of the evidence, Jack and Danielle are nearly run off the road, their PI is stabbed and their investigation points to the man Jack reveres most. As they peal back the layers of fraud and greed and deceit, Danielle’s diabetic daughter is kidnapped, and her life bartered for the document. Lies are aplenty, and time is short. Can Jack and Danielle dig deep in their hearts and discover the truth? That trust and honesty is the key to catching the killer, rescuing her daughter, and reviving their love? Where can I read this book online? While I like that the main characters have a lot of history together I felt the backstory was a little overdone. The book seemed to take forever to unfold and there are moments when Dan I and Jack seems so morose and frustratingly sappy. Don't get me wrong, I think Vicki Tharp is an excellent writer. The word usage and thoughtful way she constructed each sentence was evident throughout. I just personally would have liked a little more action and love scenes interwoven with the plot. Vicki Tharp delivers smooth prose and fast-paced suspenseful story packed with an adrenaline-rush of crime, secrets, passion, and intrigue. In Her Defense begins when Attorney Danielle McKean returns to Charleston to appeal the murder conviction of an architect. Returning to Charleston creates emotional turmoil for Danielle. She knows she will have to face her ex Jack Walsh. She doesn't want to rehash their past. Jack Walsh never fully understood why they broke up. Danielle had told him she didn' Vicki Tharp delivers smooth prose and fast-paced suspenseful story packed with an adrenaline-rush of crime, secrets, passion, and intrigue. In Her Defense begins when Attorney Danielle McKean returns to Charleston to appeal the murder conviction of an architect. Returning to Charleston creates emotional turmoil for Danielle. She knows she will have to face her ex Jack Walsh. She doesn't want to rehash their past. Vicki Tharp makes her home on small acreage in south Texas with her husband and an embarrassing number of pets. When she isn’t writing or you can usually find her on the back of her horse—avoiding anything that remotely resembles housework—smelling of fly spray, and horse sweat.